In 2017, German label Pride & Joy Music will re-issue all four releases in a revised version. First up will be “Hypnotica” which will be released on February 24th, 2017 and include the three bonus tracks „Take A Look Around“, „Dogtown Shuffle“ and „Spread My Wings“ (acoustic version). One other album will follow every three months. In 2017, German label Pride & Joy Music will re-issue all four releases in a revised version. “Trading Souls” which will be released on May 26th, 2017. Eternal Dream is a Female Fronted Power Metal band with plain European influences and an epic, unique and catchy sound. The band was founded in Malaga, Spain in 2008. In 2012 the first album, “The Fall of Salanthine”, was released and gained a lot of great feedback from the media. Several live shows with known Spanish bands followed. Since then, the six-piece hasn't stopped improving their live shows and song-writing skills, and continued to release new singles and EP's which gained Eternal Dream a solid fan base. 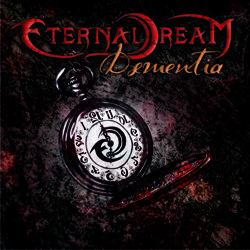 “Daementia” is the name of the second Eternal Dream full-length album which will be released on Pride & Joy Music on December 7th, 2018. It offers a full concept in which artwork, music and lyrics are parts of a whole. The spectre of emotions and feelings in a human being transport us to her psyche using C. Lewis work “Alice in Wonderland” and “Through the Looking Glass and What Alice Found There”, it’s sociocultural context, different versions (TV, movies, video games…) to give the band’s work it’s own identity and lore. “Daementia” connects the listener with different feelings and evokes memories. The compositions developed and now have a more smashing and direct power metal sound. Each song represents a feeling or a mental state, identifying characters or paragraphs created by C. Lewis, leading into a different atmosphere for each song. This results in a journey through mind guided by the music, drawings and literature. The artwork designed by singer Ana Moronta completes its perception. “Daementia” was mixed and mastered by one of the best Spanish producers, Dani G, in Dynamita Studios (Asturias) who’s best known for his work with bands such as Darksun and Last Days Of Eden.